This zucchini-noodle dish with sausage pasta, tomato, and basil is a simple and fresh way to enjoy a high-protein, low-carbohydrate meal. It’s easy to make, family friendly, and packed with flavor. Per Serving: 252 calories; 14g fat; 10.3g carbohydrates; 23g protein; 74mg cholesterol; 767mg sodium. These zucchini noodles with chicken sausage was incredible. Such a simple, easy dish but with so much flavor. I've made this recipe a few times, and also with pork andouille sausage. So good and filling! My wife made this dish for us the other night and it was really good. We are both trying to incorporate more vegetables in our diet, but I love meat, so for me this is the best of both worlds. This is one of my favorite, quick weeknight dinners! 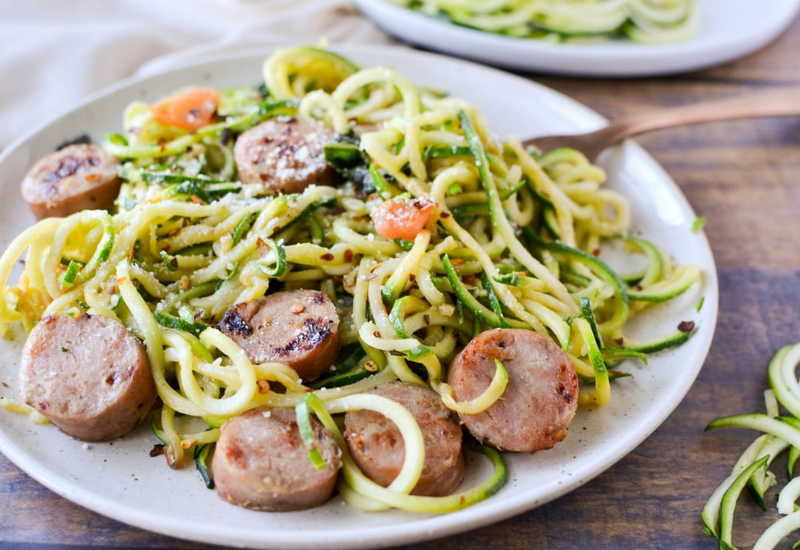 Who knew sausage and zoodles went together so well? It's not only quick to make, but it tastes amazing. Cooking the zucchini noodles in the same oil from the skillet with the sausage was perfect because it soaks up all the flavor. Love it! This is probably one of my favorite zucchini noodle recipes. Instead of using chicken sausage I used Cajun beef andouille sausage. It was really good and I definitely plan to make it again.